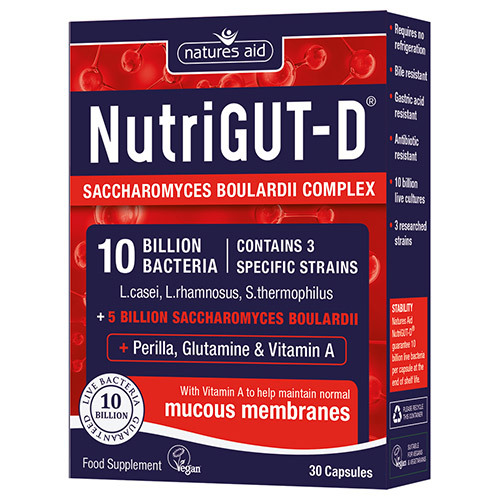 Natures Aid NutriGUT-D is a daily complex containing 3 extensively researched strains of bacteria; L. casei, L. rhamnosus, and S. thermophilus providing 10 billion live bacteria per capsule. NutriGUT-D also contains 5 billion saccharomyces boulardii, perilla extract, glutamine and vitamin A.
Vitamin A contributes to the maintenance of the normal function of the immune system and helps support the mucous membranes. The mucous membranes line many body cavities including the gut. 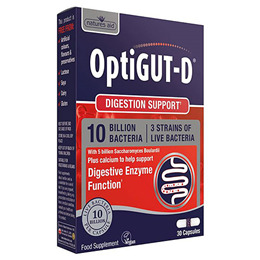 Natures Aid NutriGUT-D has been specially formulated by bio-chemists and nutritionists based on scientific research. L-Glutamine, Saccharomyces boulardii, Vegetable capsule shell (Cellulose, Streptococcus thermophilus, Lactobaciullus casei, Lactobacillus rhamnosus, Anticaking Agents (Silicon Dioxide, Vegetable Source Magnesium Stearate), Vitamin A preparation (Retinyl Acetate, Maltodextrin, Corn Starch, Acacia gum and dl-alpha-Tocopherol). Initial dose: Take 3 capsules twice per day with food for up to 10 days. Initial dose: Take 3 capsules once per day with food for up to 10 days. Below are reviews of Natures Aid NutriGUT-D - Saccharomyces Boulardii Complex - 30 Capsules by bodykind customers. If you have tried this product we'd love to hear what you think so please leave a review.